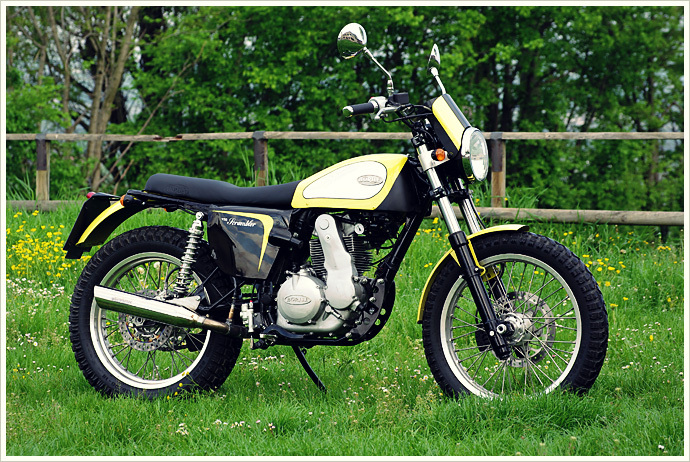 I’ve always been a fan of scrambler bikes. This has been in part thanks to a couple of 1960’s period motorbike mags I have in my collection. Hard-jawed scrambler riders riding their bikes at impossible angles, safe in the knowledge their ‘state of the art’ cork helmets will give them protection should they need it. One modern day bike builder is channeling the spirit of those original trials type bikes, but putting some new age reliability into his offerings. Based in the town of Vò Euganeo, Borile is a boutique bike workshop, producing small volume models in their range – so there is no chance of pulling up next to one at a set of lights. Today’s feature bike is the B450 scrambler, Borile’s first bike to utilise the new 450cc engine, containing componentry supplied by Ducati. And it’s a brilliant tribute to the scramblers of old.